Damn, there sure are times in life that don’t seem quite fair. All of us cross paths with a wide variety of people, from one end of the spectrum to the other side of the universe. Occasionally you’ll get to meet one or become friends with a person you might coin as extraordinary. Case in point would be Joseph Karnes. He was cut from a different cloth. You will simply not find another person on this earth like Joesph. He was witty, no actually downright funny. It was infectious getting to know what made him tick. He loved racing, every moment. And truthfully he enjoyed racing at Firebird almost as much as he adored a fine quality bottle of aged red wine. Joseph was a Mopar fanatic to put it mildly. 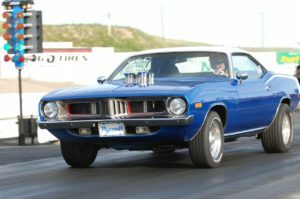 He drove his familiar blue 1973 Plymouth Cuda proudly sporting a unique motor combo. As he liked to promote, his Cuda was the only stack injected small block Mopar 360 street driver in the world. He didn’t share the fact with very many people that the good Lord was calling his name. A sickness that sadly changed his life measurably over the better part of the past year. He was someone who virtually kept everything to himself, being rather a privateer who liked to leave his mark on the race track versus dragging others into the challenges that he was up against. That was Joseph. We are very sorry to report that Joseph Karnes, 60, passed away on February 7, 2019. We all must be confident that he is in a better place today. For those of you who weren’t aware, his roots steer back to nearly the earliest of days at Firebird. He often told the story of his two Uncles Jim and Tom Hintz that originally started racing at Firebird in the late-1960’s. They were the ones who largely helped guide him in the direction of the sport of Drag Racing. “Please let your Mom know that there isn’t a day that goes by that I don’t think of your Dad and the rest of the New family and crew. I can say this for real because the jacket I wear every day here in Erie, PA, to get me through the lousy winter snow and freezing cold temperatures is my one salvation, yes, my 2012 Firebird Sportsman Champion jacket!” That was true Joseph. Dedicated might be an understatement when reflecting back on his racing career. With keen business skills that many companies were in search of, he worked all over the country. One season not that many years ago he made the commitment to compete at every point’s race of the season. Living on the east coast, some might have found this to be an impossibility, but not Joseph. 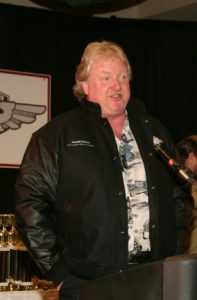 He got on a plane prior to and after every race, competing at all fifteen point’s races, virtually putting tens of thousands of air miles on his card. This was devotion of the highest order in our book. But he loved it that much. Through the years Joseph won four Firebird track championships, countless event trophies and a trio of NHRA Wally trophies that he cherished to the highest order. One of his favorite wins came in 2012. During the Northwest Mopar Championship he won the Sportsman class. As an added bonus, the champions of Super Pro, Pro, Sled/Bike and Sportsman would square off for the NHRA King of the Track title, which awarded a Wally trophy. In remarkable fashion, he not only won first round of the runoff but came back to win the whole deal, capturing the Wally and bragging rights for the Sportsman fraternity. For those of you who attended any of the Banquets over the past 20 years, you would certainly remember when Joesph got a chance to tell it like it is over the house public address system back in 2011 or 2012. That particular year is one that stands out when he was ready to challenge emcee Scott New to a duel regarding lane calls at the High School events. He was so confident and humorous in his speech that he had everyone in the room rolling in the aisles. How could you forget his one-of-a-kind attempt to portray Scott in the tower, making calls for – “Super Shopping Carts” to “Pro Baby Strollers” and the story got better from there. But honestly you just had to be there to have him tell it like it is. He was as gifted at gaining the presence of a room of people as anyone we ever met. He attended many Summit E.T. Finals. He loved the element that team competition generated and getting an opportunity to race the “best of the best” within the Northwest Division. These are all but just a few of the thoughts that we share about the character that was Joseph Karnes. Plain `n simple, he was a good friend. All of us at Firebird including every member of the New family and our entire staff will miss the infectious humor, intriguing stories, and larger than life presence that Joseph brought to each and every event. God speed my friend. You will be missed.